Homebuilders' confidence in the housing market has sunk to the lowest level in more than a year, fresh evidence that the U.S. economic recovery is slowing. 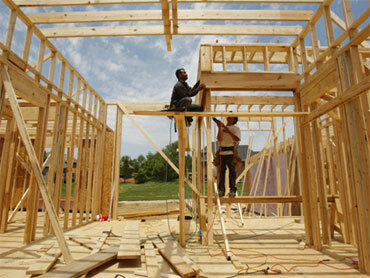 The National Association of Home Builders said Monday its seasonally adjusted housing market index fell to 14 in July. It was the lowest level since March 2009. June's index level was revised downward to 16. Builders are reporting a sharp drop in the number of buyers looking for new homes now that federal tax credits of up to $8,000 have expired. But Mike Larson, real estate and interest rate analyst at Weiss Research, said what's really weighing on the housing industry is a dismal labor market that has slowed the broader recovery. "With growth slumping again, and unemployment hovering near the double digits, we simply don't have the necessary ingredients for a sustainable recovery in housing," Larson said. "The pause in sales following expiration of the home buyer tax credits is turning out to be longer than anticipated due to the sluggish pace of improvement in the rest of the economy," said David Crowe, the trade group's top economist. Crowe does expect new home sales will improve a modest 10 percent this year from last year's depressed levels. Builders have sharply scaled back construction in the face of a severe housing market bust. The number of new homes up for sale in May fell to 213,000, the lowest level in nearly 40 years. But due to the sluggish pace of sales, it would still take 8.5 months to exhaust that supply, above a healthy level of about six months. Each new home built creates, on average, the equivalent of three jobs for a year and generates about $90,000 in taxes paid to local and federal authorities, according to the trade group. The impact is felt across multiple industries, from makers of faucets and dishwashers to lumber yards.